Situated in Eastern Europe, along the Adriatic Sea, is the beautiful country of Croatia. Home to over 1,000 islands, it has more than 4.2 million residents. Croatia offers you a wonderful beach holiday, historic architecture, gorgeous nature and quirky museums. Popular attractions include the ancient city walls in Dubrovnik, Plitvice Lakes National Park and Diocletian’s Palace in Split. Pack in the sun screen for a vacation by the sea, because cheap flights to Croatia are now available for a limited time! Croatia’s hub airport is Zagreb Airport (ZAG), which is a 25-minute drive from Zagreb’s city centre. 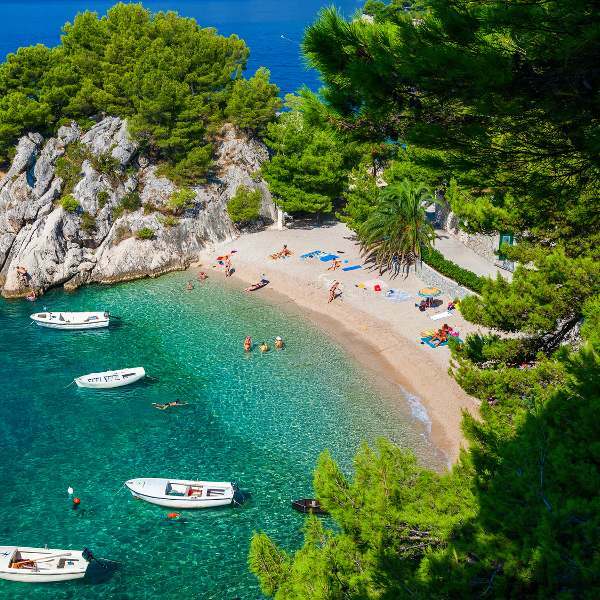 Croatia’s sunny weather during spring, summer and autumn provide wonderful settings for a day at the beach. Relax at locations such as Plat Beach in Dubrovnik, Baska Beach on Krk Island and Zlatni Rat on Brac Island. Discover the wealth of beautiful historic sites around Croatia and learn the story behind this country. Attractions like these include the ancient city walls in Dubrovnik, Diocletian’s Palace in Split and the Hvar Fortress. 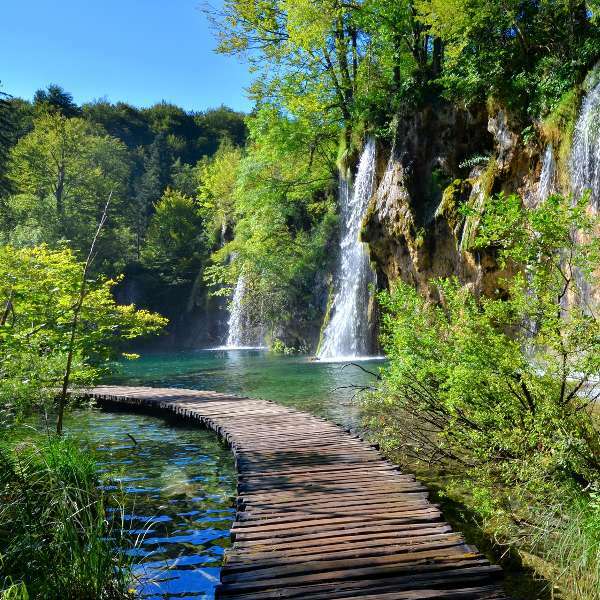 Rejuvenate yourself by exploring all of Croatia’s scenic parks and gardens. Some of the loveliest locations include the Plitvice Lakes National Park, the Marjan Mountain Park in Split and Mljet National Park in Dubrovnik. The most popular time to explore Croatia is during the summer (July – August), when the temperatures reach their peak, hotel prices spike and the coastal resorts are their busiest. The benefit of visiting during these months is the chance to enjoy this nation’s energetic nightlife and numerous open-air cultural events. Make sure to book your hotel room well in advance to ensure you get the best deal. If you would rather skip the crowds, visit Croatia between May and June (spring) and between September and October (autumn). During these periods, the weather will be wonderfully sunny (ideal for swimming and sunbathing), the crowds will be thin and all the tourist attractions will be open. Other outdoor activities you can enjoy during these months include rafting, sea-kayaking, mountain-biking and hiking. November – April (winter) is the cheapest time fly to and stay in Croatia, but the temperatures become chilly, and many hotels and tourist sites along the coast close. Discover one of the major tourist destinations in Europe – Croatia. Situated on the eastern side of the continent, this beautiful nation sits along the Adriatic Sea, meaning you can look forward to a delightful beach holiday. Besides this wonderful feature, Croatia offers you treasures such as a lovely culture, rich history and awe-inspiring nature. The capital, Zagreb, is the heart of the country’s culture, arts, entertainment, sports and education. Situated inland, this destination includes some of Croatia’s most interesting museums, the finest galleries, alluring eateries and exciting shopping venues. When you’re not exploring this scenic city, let your eyes feast on its gorgeous parks and lakes, and be sure to admire the historic architecture of Gornji Grad. Experience the Dalmatian lifestyle in the coastal city of Split. This charming destination is where you can enjoy memorable private tours, indulge in hikes along trails that offer breath-taking views, and sample some of the Dalmatia region’s best wines. 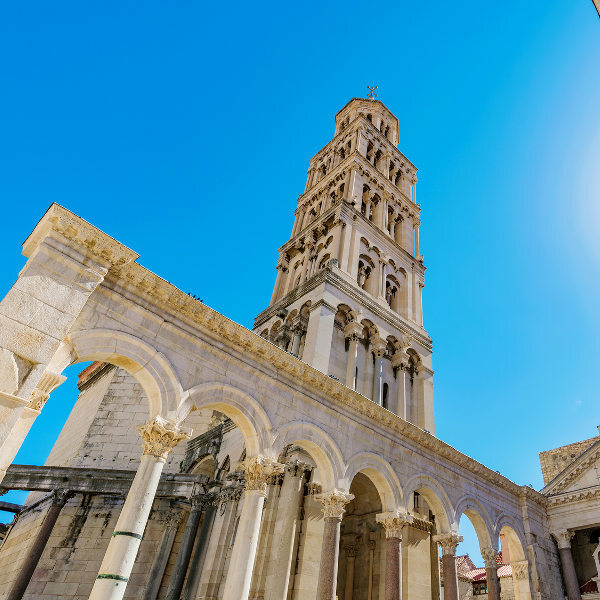 Split’s most popular sight is the ancient ruins of Diocletian’s Palace, which forms approximately half of the city’s old town. Dubrovnik, another gorgeous city on Croatia’s shores, offers you the opportunity to discover its magnificent medieval walls that treat you to amazing views over the city and the Adriatic Sea. Discover more historic palaces from various periods, relax at the many gorgeous beaches, or rent a yacht and enjoy more scenery around this lovely European destination. Compare several airlines and book your cheap flights to Croatia online at Travelstart! Travellers should receive all the routine vaccinations before they depart for Croatia. You may additionally need to receive a vaccination for hepatitis A, which is spread through contaminated food and water. During sunny days, make sure to put on enough sunscreen. An SPF level of at least 15 is sufficient. If you intend to hike or camp during the summer, watch out for ticks, which carry diseases such as encephalitis and Lyme disease. In Eastern Slavonia, wear long sleeves and use insect repellent. Should you be driving on a on rural road, you will get drivers that stop to let you pass. It is customary to wave to him or her as a show of thanks.